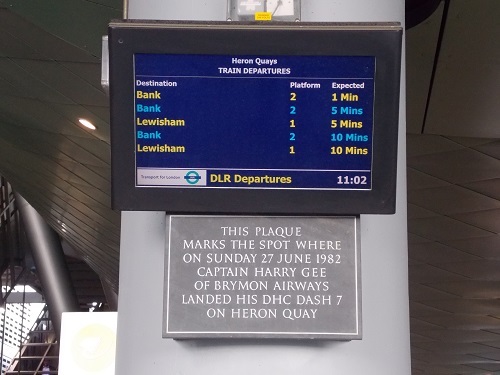 Ignored by the vast number of commuters, there is just below a destination screen in Heron Quays station a plaque that celebrates an event that was to have far reaching consequences for the development of The Royal Docks and London City Airport. 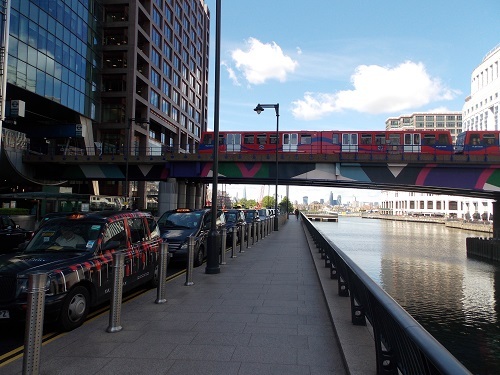 The idea of an airport in Docklands was first proposed in 1981 by Reg Ward, who was Chief Executive of the London Docklands Development Corporation (LDDC) that had been given responsibility for the regeneration of the area. After discussions with Sir Philip Beck (Chairman of John Mowlem ) it was considered an idea worth looking into and by November, Mowlem and Brymon Airways had submitted an outline proposal to the LDDC for a Docklands city centre Airport. However there was considerable doubt whether the runways would be long enough even for STOL ( short take off and landing) planes at the Royal Dock site. To allay the doubters Mowlem and Brymon proposed a test flight and landing in the Docks, this was not feasible in the Royal Docks but Mowlem who were involved in the building of the Canary Wharf site cleared a site near Heron Quays and put down a surface to enable a plane to land. The temporary runway was about 1000 metres long, which was seen as the minimum needed even for STOL. The Civil Aviation Authority was prepared to offer a special licence for insurance purposes and the flight was given the go ahead. 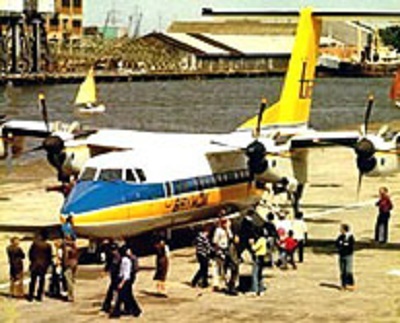 On 27 June 1982 Brymon Captain Harry Gee landed a de Havilland Canada Dash 7 aircraft on Heron Quays runway in front of a crowd of bemused spectators. 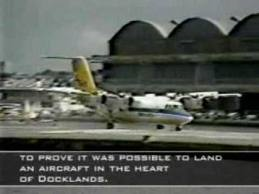 The success of the flight proved an airport was possible in Docklands, however it was not the only flight from Heron Quays. In 1983, during the public enquiry into the Airport, the inspector, Montague Smith, and his technical expert Air Vice Marshal B. P. Young, requested a demonstration flight. Once again Harry Gee was the pilot and the two officials became the first passengers in a flight out of the Docks. Things then moved quickly and London City airport was constructed , The first aircraft landed on 31 May 1987, with the first commercial services operating from 26 October 1987. The Queen officially opened London City Airport in November of the same year. 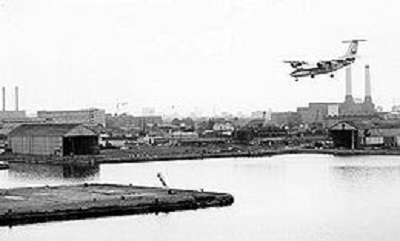 For anyone living on the Isle of Dogs, aircraft taking off and landing are a constant reminder of the close proximity of London City airport but few would realise the airport would not exist at all if the famous flight of Captain Harry Gee into Heron Quays had not been a success. Surprising there is very few photographs of the momentous occasion but there was a very short film made of the landing by a news company. By isleofdogslife in Human Life on May 15, 2014 . Well thank you!! Am happily overwhelmed having read the insightful article written in 2014 regarding London City Airport, featuring my father, Harry Gee! 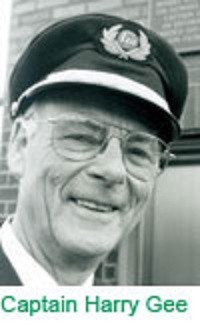 Many years of the love of flight, including both his career as a naval aviator landing on triangular decks and an airline pilot in various regions of the world, were to portend his accomplishment later in life. And here is a piece of irony to his life, he once lived in a cottage in Essex, named ‘Herons Rest’. The plaque at Heron Quays to your father is testament to his flying expertise, landing a plane was no small achievement. The runway was basically a cleared part of the dock, if you look at the news film of the event I am always amused by the faces of the onlookers who can’t quite believe what they are seeing. Herons was obviously a lucky bird for him.